I have a theory that, during the 80s, you could judge the success of New Order by how low Hookie was carrying his bass. Each time I saw the band that bass seemed to slip further down his leg, reaching a point around his knees, where I guess it couldn’t get any lower. I spent the night at the Sunderland gig staring in wonder at Peter Hook and that bass. I swear he was wrestling and fighting with his guitar, as if it had a life of its own, and was trying to escape his clutches. He was definitely becoming a fully fledged rock star; indeed the entire band seemed to exude a level of confidence way above that which I had witnessed on the previous two occasions I saw them. They were riding on a wave of success; Blue Monday had propelled them to another place, and the Mayfair was packed. The ticket it pretty impressive too :). Setlist: Face Up; Thieves Like Us; Age of Consent; Your Silent Face; Sooner Than You Think; ICB; The Village; 5 8 6; Sunrise; The Perfect Kiss; Blue Monday (cue for major dancing). New Order Newcastle Mayfair 10th September 1986. New Order released two albums before I saw them again; these were Low-Life (1985) and Brotherhood (1986). Their set at Newcastle Mayfair in 1986 drew heavily from their most recent release. I recall being disappointed, largely because they didn’t play Blue Monday, and because there were few songs that I recognised at all. 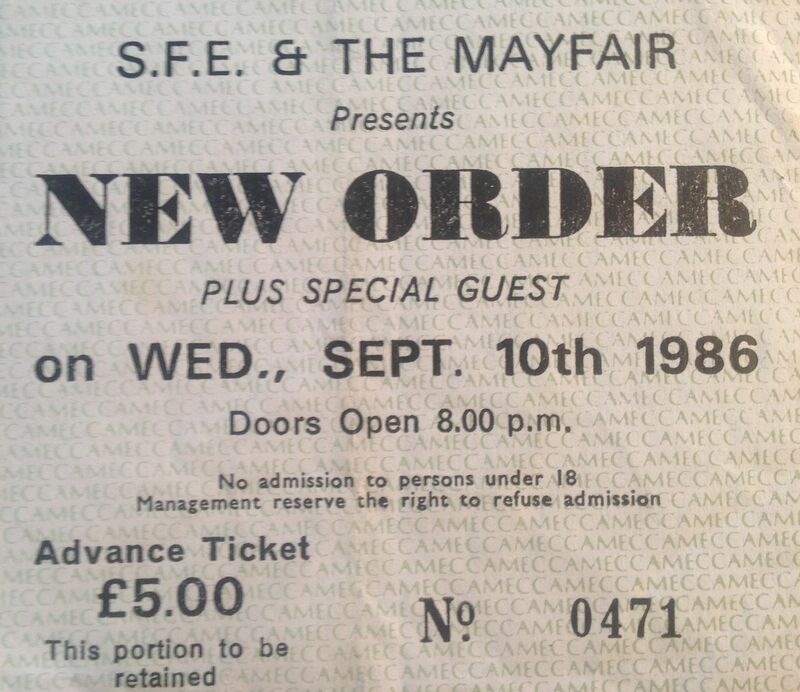 This gig certainly wasn’t one of the best times that I have seen New Order, and to be honest I remember little about the gig. I think Hookie’s bass remained at knee height. It was 20 years until I saw them again. Setlist: State of the Nation; Everything’s Gone Green; Way of Life; Angel Dust; Paradise; Weirdo; Confusion; Subculture; Age of Consent; Bizarre Love Triangle; The Perfect Kiss. Newcastle Academy 11th Oct 2006. 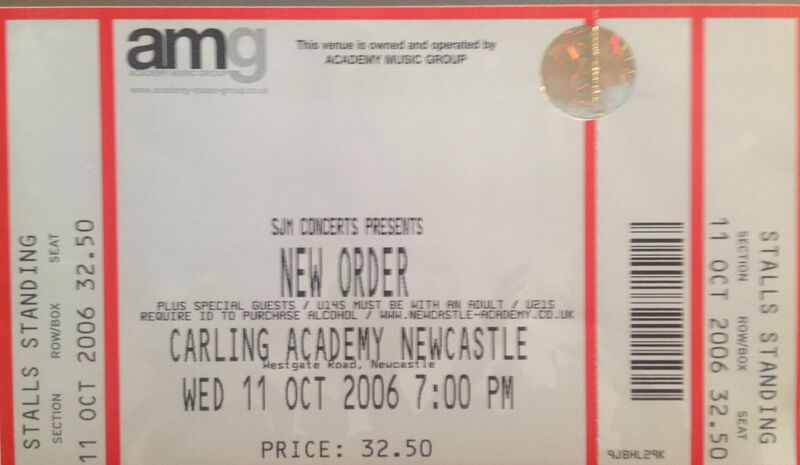 Roll on 20 years and David and I were in Newcastle Academy to see New Order. This was their first visit to the North East since the Mayfair concert of 1986. In the interim the band had released 4 albums including the highly successful Waiting for the Sirens’ Call, which came out in 2005, and was generally recognised as a return to form. Gillian Gilbert left the band in 2001, and was replaced by Phil Cunningham. The rest of the line-up (Bernard Sumner, Peter Hook and Stephen Morris) remained unchanged. Over the 20 year period, there had been long gaps between releases and concerts, with New Order spending a lot of time in America. Their UK shows were mainly restricted to appearances at festivals, a small number of shows in Manchester and some arena concerts elsewhere. As a result, this Newcastle return was hugely anticipated, and tickets sold out immediately they went on sale. The Academy was completely packed; we were on the floor close to the stage and couldn’t move, and the band didn’t let the crowd down. New Order played a long set drawn from across their career, including a handful of Joy Division songs. That night they played with a passion, and seemed to be in a good mood. A great concert. Hookie’s bass still remained at knee height, which was comforting. 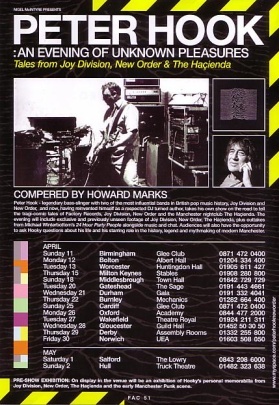 The ticket price had risen from £5 in 1986 to £32.50 in 2006, which was less comforting. Setlist at Newcastle Academy in 2006: Crystal Regret; Ceremony; Who’s Joe? ; These Days (Joy Division); Transmission (Joy Division); Krafty; Waiting for the Sirens’ Call; Your Silent Face; Guilt Is a Useless Emotion; Bizarre Love Triangle; Temptation; The Perfect Kiss; Blue Monday. Encore: Shadowplay (Joy Division); Love Will Tear Us Apart (Joy Division). Sadly New Order split in 2008, the other members fell out with Peter Hook in a very public manner, and ultimately regrouped without him. Laura and saw their Newcastle Academy concert in 2012, which I blogged about at the time. On May 17,1980, Ian Curtis committed suicide at his parents home in Macclesfield, leaving the remaining members Bernard Sumner, Peter Hook and Stephen Morris shocked, and with an uncertain musical future. Ultimately they decided to carry on, initially as a three piece and under a new name: New Order. 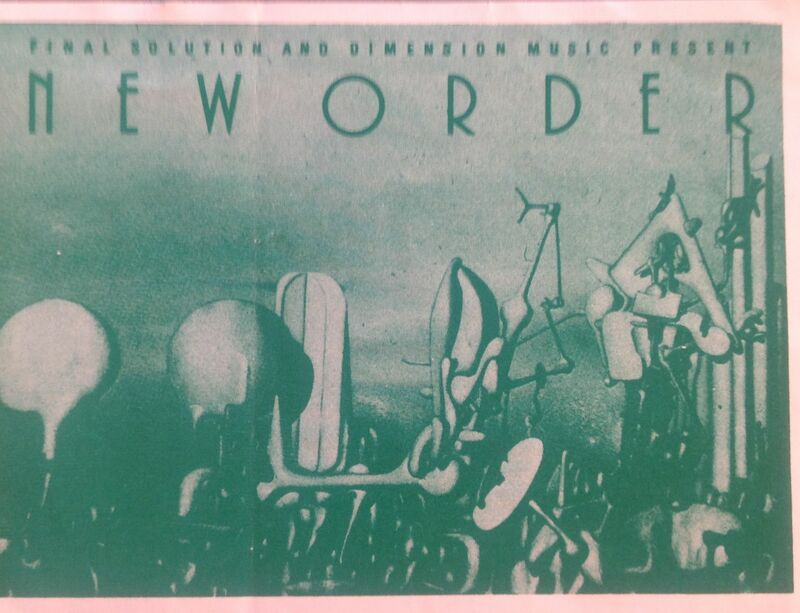 By late 1980 New Order was playing gigs at small venues in their home town Manchester. Their repertoire consisted of new songs, other than “Ceremony” (an unreleased Joy Division song which was played live before Curtis’ death) and “In a Lonely Place” (demoed in the studio). Guitarist Bernard Sumner took on the role of main vocalist and Gillian Gilbert, Stephen Morris’s girlfriend, joined on keyboards. 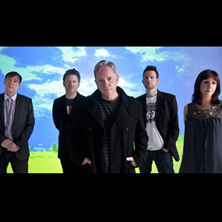 New Order played a couple of concerts in the USA, and started to venture further afield in the UK. I first saw them at a gig at Middlesbrough Rock Garden in early 1981. The concert was reasonably well attended, although by no means sold out. I remember being struck by how different their music was from Joy Division; much more electronic, less dark, few vocals. There was a sense that we were witnessing something very special, and very different from the direction that other new wave bands were going at the time. This was a universe away from the thrash of Warsaw that I had witnessed only a few years earlier. The songs came from their yet to be released first album “Movement”. A bootleg exists of a concert in Glasgow from the same period, which suggests the set at the Rock Garden was probably something like this: In A Lonely Place; Dreams Never End; Truth; Mesh; Procession; ICB; The Him; Cries & Whispers; Senses; Ceremony. My memory (which sadly, is quite often wrong these days) tells me that they also played an instrumental version of Love Will Tear Us Apart, towards the end of their set, possibly as an encore. However, this also seems unlikely, as the song doesn’t feature in any other published 1981 setlists. Having said that, they would sometimes play the old Joy Division classic during the sound check; so who knows? 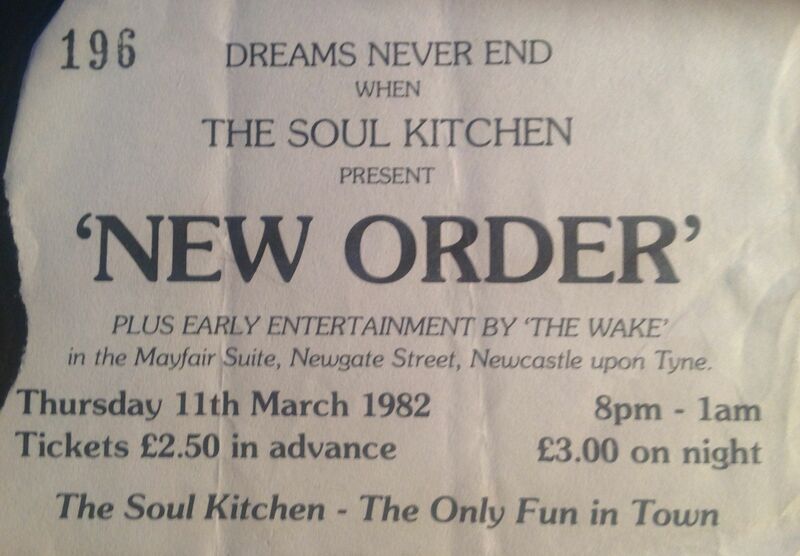 A year later local promoters The Soul Kitchen (“The Only Fun In Town” 🙂 ) booked New Order (“Dreams Never End”) for a concert at Newcastle Mayfair. By now they were playing several new songs which would appear on their 1983 second album “Power, Corruption & Lies”. The Mayfair was quite full, and I saw a big difference in New Order, compared to their performance at the Rock Garden. This was a much more confident band, more dance, more electronica. Blue Monday and massive success were yet to come, but you could sense that this was an important band. Bernard Sumner was much more of a front man, and Hookie’s bass was slipping further and further down to his knees; they were both forming their own rock star personas. Support (or “Early Entertainment” as the ticket says) came from Scottish band The Wake, who featured a young Bobby Gillespie. Setlist from Newcastle Mayfair, 1982: In A Lonely Place, Chosen Time, Denial, Ultraviolence, Senses, Leave Me Alone, Hurt, Procession, Temptation. New Order line-up: Bernard Sumner – vocals, guitar, Peter Hook – bass, Stephen Morris – drums, Gillian Gilbert – synthesizers. By 1977 I was seriously into punk and new wave, and the new bands were starting to play gigs up in the North East. I still liked classic rock bands, but was also excited by the urgency and immediacy of punk. This gig was held at Newcastle Guildhall, a venue on Newcastle Quayside, which no longer holds concerts and is now a Tourist Information office. Punk was still in its early days. The Adverts had released One Chord Wonders as a single, but had yet to release Gary Gilmore’s Eyes. Penetration were starting to become known locally, but had yet to land a record deal. Penetration were quite a favourite of mine at the time. Marie and I saw them many times, and often ran into Pauline and the rest of the band at local punk gigs. This gig was memorable for another reason however. The first band up was a new combo who had come from Manchester to play. They were called Warsaw and Pauline and Gary from Penetration told us that they had played with them in Manchester a few days before at The Electric Circus. They had been impressed by them and had invited them up to Newcastle to play the Guildhall. Thus, as a late addition to the bill, there are not listed on the flyer. Marie and I arrived early primarily to make sure that we caught Penetration’s set, and as a result we were there for Warsaw. Warsaw were, of course, to become Joy Division some months later. I would love to be able to report that we experienced something momentous that evening. However, my recollections were of a band who were nervous, and obviously still learning to play. I don’t recall Ian Curtis displaying any of the manic dancing way that would become his trademark. Rather, I remember a shy guy who appeared uncomfortable on stage. I saw Joy Division a year or so later supporting the Buzzcocks and Ian was incredible; however what we saw at the Guildhall was a new, young band playing pretty average garage punk songs. Reports of the time suggest that they will have played early songs: Reaction and Leaders of Men. A recording of Warsaw playing Reaction at Middlesbrough Rock Garden exists, and can be found on YouTube. Next up was local band Harry Hack and the Big G; I recall one song about “Brown Dog” (Newcastle Brown Ale). Pentration were, as always, excellent; they had some great songs which I was starting to know, having seen them many times. The Adverts were also a good live act. TV Smith was a dynamic front man, and Gaye Advert stood quietly alongside him playing bass. Great memories. I note that the flyer states “all bands to be recorded”. I wonder if any recording exists. I would love to hear it. The evening was a chance to hear Peter Hook talk about his life with Joy Division, New Order and the Hacienca club. The stage was set out with several of Hookie’s bass guitars and various memorabilia from the bands and the Hacienda. Howard Marks came on and introduced Peter Hook who strapped on his bass and treated us to a couple of instrumentals. Then it was into the Question and Answer session with Howard Marks asking questions on behalf of the audience (we had all been invited to write questions on a card before the show). Some interesting insights into the early days of two great bands and “how not to run a club”.